Hakone Chocotto Ichigo is a 6% fruit beer from Hakone Beer and this was a present from Joe for a late Valentine’s Day or maybe an early White Day. This is produced in such a limited amount that Hakone Chocotto Ichigo is only sold at the store in Hakone. It is usually on sale from mid-January and has a shelf life of only 90 days so it’s a blink and miss it beer. Hakone Chocotto Ichigo is such a limited beer you can only get it at the brewery shop. 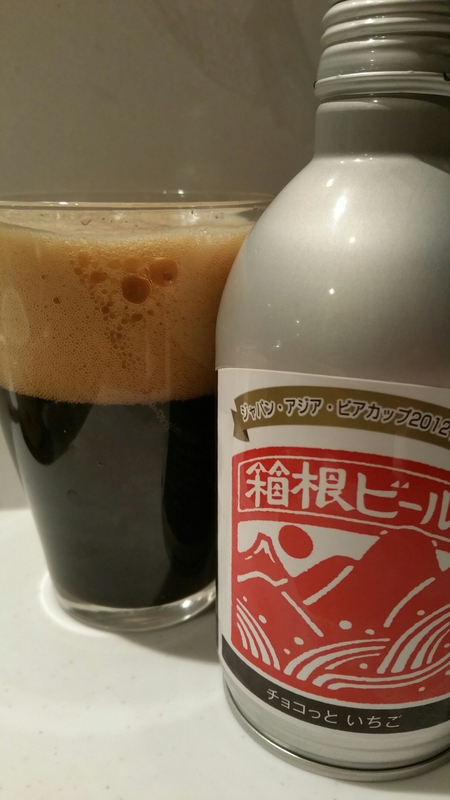 Hakone Chocotto Ichigo is classified as a fruit beer though it poured out very much like a porter that had been heavily carbonated. The tan head was frothy, almost like aerated milk for a latte, and was just as light as you would expect. My brain was confused – is this a fruit-flavoured porter or a porter-style fruit beer? If there were fresh strawberries used in the making of Hakone Chocotto Ichigo then they must be the most delicate smelling ones, as there was the merest of whiffs of them when compared next to a punnet of strawberries. The chocolate and roasted coffee notes were far stronger. The roasted malts that produce the chocolate flavour were much stronger in comparison to the strawberry taste that barely registers until you swish the beer around your mouth – not the most attractive thing to do, but damnit, I wanted that strawberry hit! The overriding feeling though was that Hakone Chocotto Ichigo had been infused with perhaps one or two strawberries in a can as the porter-esque flavours came through stronger than anything else. Hakone Chocotto Ichigo would be better if it had been brewed as a porter. And without the addition of strawberries. Hakone Chocotto Ichigo can be bought at the Hakone Beer store from mid-January while stocks last.